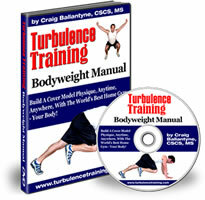 Exercise and energy is the take away theme in Turbulence Training Day 10. Home fitness workouts that'll burn fat and sculpt your body in 4 weeks. Welcome to day 10 of Turbulence Training's Buff Dudes and Hot Chicks fat burning workout. "Hello and welcome to another sunny day here in London, today's day 10 of the Buff Dudes and Hot Chicks workout. I'm Asad from Better4Fitness.com. And oh my gosh, I'm buzzing after today's workout, it was the best day so far (exercise and energy!). And after having a really good workout Monday and now a really good workout today, I'm really looking forward to Friday where I think I can make it a really really good second week. So this is what Turbulence Training's doing for me, it's got me feeling like this so what can it do for you! Go to Better4Fitness.com, check out what I'm doing and get involved too, that's the whole point of this! For now you've got today's exercise speed mash-up coming up, enjoy it and I'll see you tomorrow, take care."